You've gone to the store and looked at Weber, Char-Broil and a dozen more. You've listened to salespeople tell you about surface areas, BTUs, rotisserie burners, side burners, infrared burners, and a dozen things you've never heard of. Now you're more confused than before. What you need is a little friendly advice in your grill shopping. Well, here you go. Rule number one: You get what you pay for! 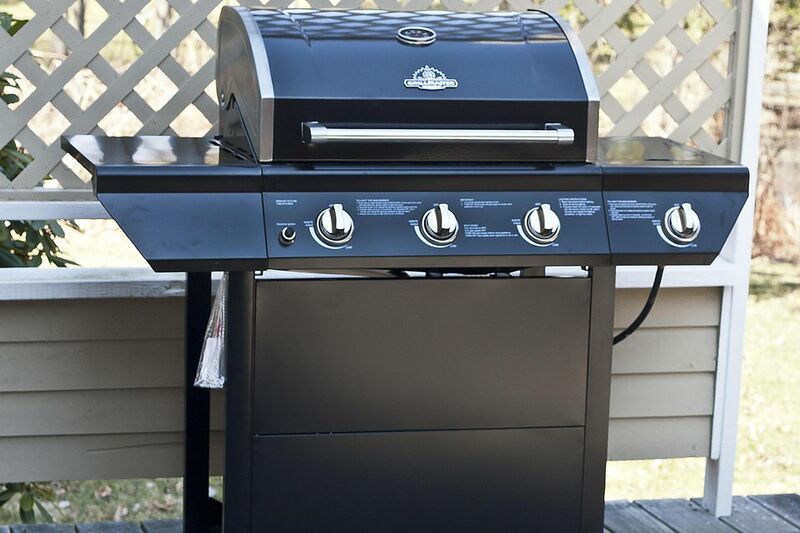 If you drop by your local department or hardware store (even grocery store) you will see gas grills in the price range of around $150 to $300. However, there are some that can run over $10,000. There are literally hundreds of grills on the market each year, though your local stores may only carry a few, so having an idea of how much you want to spend will help narrow your search. When comparing prices, find out whether or not a propane tank is included. This can add about $20 to $30 to your total cost if you have to buy it separately. The second thing to take into consideration is the fuel. Do you want propane or natural gas? Natural gas requires a gas line at the location of your grill. Many grills can be bought in either configuration but you can't run a propane grill on natural gas or vice-versa. Many lower priced grills do not have the natural gas option although more and more grills do these days. Watch the price, though. Some natural gas conversion kits can cost between $50 and $100. Of course, natural gas will cost you less in the long run and save you trips to the propane store. Next is the material the grill is made out of. The main body of the grill is usually made from cast aluminum, sheet metal, cast iron, or stainless steel. Stainless steel is the preferred material for professional cooking equipment and the most expensive, but not all stainless steel is created equally. One thing to watch for is not just the body, but also the frame. There are many "stainless steel" grills that have painted steel frames that can rust. Once you decide on the material, look over the whole grill to see how it's put together. Is it all stainless steel (try using a magnet)? Manufacturers take shortcuts with metal! The truth is that cast aluminum will typically outlast any quality of stainless steel. Once you have these factors decided, you need to pick the size and features you want. For the size, think about the kinds of things you will want to cook on your grill and for how many people you might want to cook for. If you're planning on a large turkey or being able to cook up to 40 hamburgers at a time, you'll want a larger grill. If you just cook a few steaks or chicken breasts once in a while, you'll probably want a smaller one. Also, look at the space you have for the grill. Get one that will fit safely and conveniently. Do you want a side burner? How about multiple level cooking surfaces, or a smoker box, side burner, rotisserie burner, lights, or any one of a dozen things that get added to a grill these days. Remember that a basic grill will do lots of stuff and most of the extras get very little use. Features cost money! Only buy the features you know you'll use. Another factor is the BTU rating. This is a measurement of the amount of heat created by the burner. A grill with higher BTUs doesn't necessarily produce more heat. It is a factor of the heat created, the size of the grill and how well it holds and distributes that heat. Don't buy a grill just because it has a high BTU number. Compare that number with the size and the shape of the grill. Smaller more compact grills can produce higher cooking temperatures with lower BTUs. Materials, the thickness of metals, and quality of parts play a major role in how long a grill will last. However, the biggest part of the lifespan of your gas grill is how well it is taken care of. A well taken care of grill can last a long time! The best grill out there will rust and fall apart if it is left uncovered and uncleaned. Of course, a better grill will last longer, but you can get a long time out of a cheap grill is you take care of it. One way to separate the bad from the good is to look for name brand grills versus store brands. Ask the salesperson at the store you are shopping at if the grill you are looking at is one of their brands or a national brand. Name brand gas grills have replacement parts, customer support and a company that will survive or not based on the quality of their products. Store brands change factories annually and lack the depth of support that will help keep your grill working for years to come because if you take good care of it, it should last for many, many years. Read up about some of the best gas grills on the market today. These are broken down by price—under $250, under $500, under $1000, and between $1000 and $2500—and should give you a good idea of where to start.